Last week we rebooted our Mordheim Campaing in Joensuu (Finland), and therefore I decided to start playing a new warband. I considered to play Beastman or Undead, but finally I thought about playing with Chaos because of the hype around the The End of Times – Warhammer Campaign, where Chaos is going to destroy the Warhammer world. I wanted to contribute with my Nurgle’s warband! So, my new warband is Carnival of Chaos. Once more I’m going to use original models from GW. I love the “carnival” look they have. Getting these guys was a bit difficult (and so expensive), but I think they’re worth it. The miniatures are not the best ones in the market nowadays, but they have something special. If you are a collector, you will probably understand me. 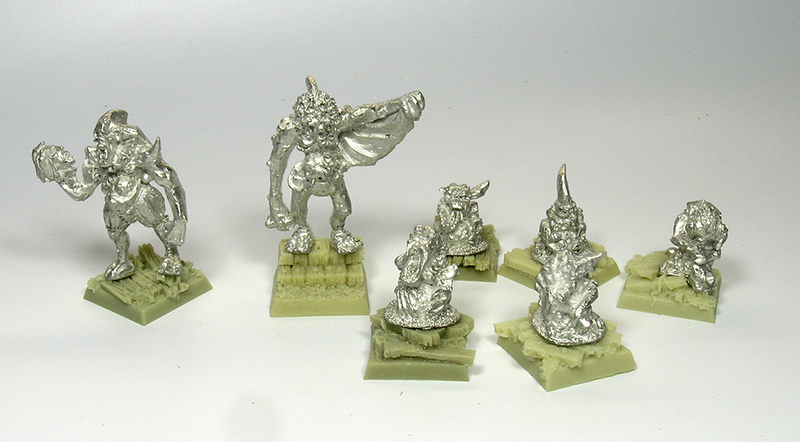 Fortunately I could buy the whole original warband, plus two extra henchmen (I have not prepared them yet). So I already have the core for my warband, but probably I will need extra models in the future. Indeed, the original warband doesn’t include a second Tainteed one and therefore, I need to find an alternative. I also have five nurglings. I don’t know why, but I love these little guys. Perhaps because their malicious faces! The Carnival of Chaos models are specially nice. One has a bagpipe! In this case I discarded preparing my own bases because I don’t have enough time. Thus I bought resin bases from Micro Artsimulating a wood floor. They are really nice and cheap! I bought two 20x20mm blisters and another one of 25x25mm for the Brutes and Master. I think I will have enough bases if I want to increase the warband in the future. The bases are different enough to get very distinct vignettes for my miniatures. And there are enough flat bases to put the nurglings with their big metal base. To properly set the other models I used metal rods between the feet and the base. I don’t know when I could paint them, but I want to use a bitonal scheme: red and yellow, the original one. About my Warband, I decided to spend some crowns in Nurgle’s blessings. You can check the Carnival of Chaos rules here. The Tainted ones can only pick these blessings at the beginning of the Campaign, so I think it’s a good idea to invest some money in them. One of them has Bloated Foulness (+1 W, +1T, -1M) and the other one has Nurgle’s rot (if the Tainted One makes a successful roll to hit of 6 this will result in the target model contracting the Rot…). The rot is bloody expensive (50 crowns) but it’s so fun. Indeed, my Master learnt the homonymous spell in Nurgle Rituals. So I will spread the Nurgle’s word!!!! Because the great cost of these blessings I couldn’t recruit any demon for my warband (Nurglings or Plague Bearers), but I will do it after playing the first game. In addition, my poor Brethrens only have the free dagger. Because the first games are not very crucial and we only need to collect as much money as we can without heavy loses, I think I can easily afford them with my heroes until I can recruit some demons and fortify my Brethrens. You can check my list in the following link. Have you ever play with or against Carnival of Chaos? Feel free to comment and share your opinions! I’ve just bought a band like this one. As you said, the carnival appearance of these guys is wonderfull, and I bend my brain to know how to paint them. I’m going to receive some brethrens ( without arms not weapon ), whose will be in excess regarding to the miniatures I already have. I read you need some more, so if you are interested, just tell me :). I don’t know yet, but the original color scheme from Games Workshop in yellow and red, is very well balanced. It is simple, but amazing. The guy’s from GW make always good choices in term of color, and in term of where the color is applied on the miniature. When I played the collectible card game Magic the Gathering in the late 90’s, I had this card named “Jester’s cap”, where the character weared a blue and white jester’s cap : http://www.abugames.com/images/products/signedmagiccards/s2094.jpg, and I don’t know if I keep a unique color scheme for all of the guys in the band, or if I use different ones for each character. I also wonder how to paint a realistic rotting flesh and gut, as these are the first nurgle miniature I bought. PS : I’d like to compare the cost of my miniatures and yours, would you tell me how much you paid for your band ? Thanks for you answer. I like very much the classical GW pattern, so probably I will use it. Furthermore, I like the white and blue scheme from the MtG card. So now I’m considering to use different patern in every miniature! I have the same problem about the rotting flesh and gut. I have never painted Nurgle’s sevants. I think I will apply green enamel filters to achieve a realistic looking. But some experiments are needed. I paid a lot…200€ for the original Warband, plus another 30€ (including shipping cost) for three extra brethrens. But I think they worth it 🙂 Now I’m sniping at a Cult of Possesed warband! Or the old Bretonnian model Jules the Jongleur fits in nicely. I am using the latter and will use liquid greenstuff to add boils to his face.